Amidst all the church spires in central St. Petersburg in Russia stood two minarets belonging to a mosque. 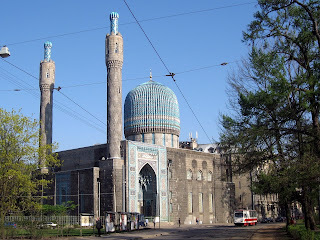 Unusually enough, the mosque was unnamed and many described it as the Saint Petersburg Mosque. I found the mosque accidentally when I was studying the map of St Petersburg. The mosque was built in 1913 and at that time, there were about 8,000 Muslims living there. The mosque was built to accomodate all these people. Its architect wanted to copy the Gure Amir in Samarkand in Uzbekistan. Gure Amir was not a mosque but rather a tomb of Tamerlane. Tamerlane was recognised as a military genius wwas the most powerful ruler in the Muslim World in the 15th century. Work began in 1910 when Emperor Nicholas II gave the permission to purchase the site. The site was opposite the Peter and Paul's Fortress, said to be where the first fort was built in St Petersburg. Skilled craftsmen from Central Asia worked on the mosque. Greetings from the City of St Peter in Russia! What am I doing here I hear you ask. I am attending an APEC Meeting or to be more exact, APEC Women and the Economy Forum. You ask why me? Women issues are part of my portfolio. I look after Community and Culture half of the Ministry of Culture, Youth and Sports. Community covers everything there is from women, children, old aged, the special needs etc. That is why I am here together with the other 21 economies representing their women side as well. 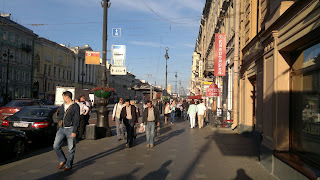 Why St Petersburg? I don't know. The Russians are this year's APEC hosts, so they choose whichever city they wanted. You think St Petersburg is far? Well, you should know that the APEC Children's Games will be in Yakutsk. The APEC Summit will be in Vladivostok. St Petersburg by comparison looks much milder. Brunei paintball enthusiasts must be very happy when His Majesty was seen popping a few shots using paintball gun when he consented to visit the Program Khidmat Bakti Negara (PKBN) camp last Thursday, 21st June 2012. When I took this photo, His Majesty was being instructed on how to use the gun. When he shot the gun, despite not being able to use it before, he hit the bullseye with every shot! The paintball facility was originally set up for use by the PKBN trainees and I understand that with the end of their training, the facility will be available for rent for a short period of time. A permanent facility will be built in Jerudong. I was away for the whole week of 11th to 17th June to attend a meeting in Danang, Vietnam and during that week, I missed the opening of the Marine Biodiversity Centre which was officially opened by the Minister of Industry and Primary Resources. 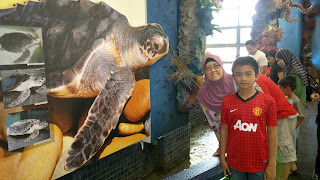 So on the 18th which was a public holiday, I went there with my wife and my son. We were suitably impressed. The centre is not that big but it contained enough details that would take the average reader quite a while to read. Inside the buildings there were a couple of small aquariums filled with lobsters, shrimps, groupers (ikan kerapu) and white fish. There was a lone white fish when we were there. The officers on duty told us that they had to fish the white fish out as the groupers (much larger) tend to be territorial and was attacking the white fish. 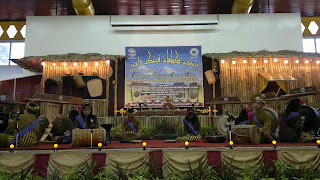 I was honoured to be invited to officiate at the 18th Gulingtangan Competition for Brunei Colleges and Secondary Schools on 23rd June 2012. It was held at the Raja Isteri Pengiran Anak Saleha Secondary School in Tutong. I have never been to the competition before and I had to admit I thought I would be looking at something very traditional which I always see being performed. When the first group from Maktab Duli went up the stage and started their performance, it was an eye opener. They were good, in fact, they were very very good. I did not realise that even a traditional instrument such as guling tangan could be made to sound the way it sounded. This is not even taking into account other on stage performances, theaterics and costume worn by the students. I was impressed. I had a bad flu on that day but the performances blew me away. 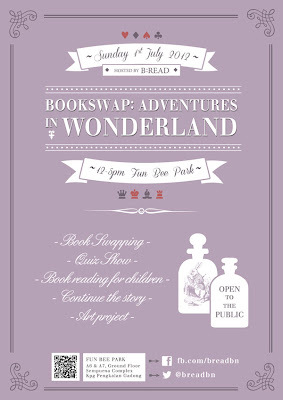 B:READ will be organising their next Book Swap Event at Fun Bee Park, on Sunday, 1st July 2012. It is a follow up to their previous Book Swap Event at OGDC last March. Activities during the next event will range from a quiz show and a writing collaboration, as well as the book swap. For those who are more hands-on with their creative outlet, Fun Bee Park will be offering a 30% discount to bookswappers, where they have the chance to create book marks out of either clay, paper or batik, make top hats like the Mad Hatter and the March Hare, fashion bunny ears and more. The offer will only be available on that day. Everyone is invited to bring at least one book along (no limit), meet other book-lovers, browse books brought by others, and walk away with new books and friends. Fun Bee Park is located at A6 and A7, Ground Floor, Sempurna Complex, Kampong Pengkalan Gadong. If you don't know where that is, call the shop at 2457729. When I saw this stamp, I was very curious. 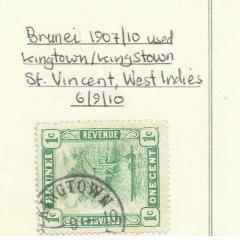 Why would a Brunei stamp issued in 1907 be used in Kingstown, St Vincent in the West Indies? There are a number of possibilities. My best guess would be that the letter was mailed on board a ship. Normally the stamps would be stamped 'PAQUEBOT'. However in this case, it was stamped using the regular stamp that was available. Today the Brunei Cannons Exhibition was opened officially﻿ at the Malay Technology Museum at Jalan Kota Batu. I was most honoured to be invited to officially open the exhibition. Cannons have always been a fascination for me. The exhibition is opened to the public showing various examples of cannons that are in the Brunei Museums collection. Unfortunately due to space, only 31 of the about 800 cannons that the museum has, are shown in the exhibition. But these 31 are more than sufficient to show the richness and the wealth of cannons that we have here in Brunei. 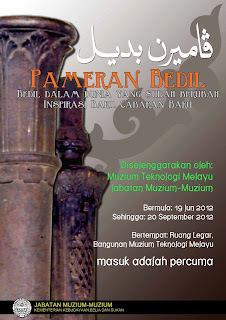 It is open to the public until 20 September 2012. During the exhibition, this book entitled "Bedil: Khazanah Ristaan Brunei Silam" will be sold, priced at $9. Its normal price is $12. This book is a worthwile addition if you ever wanted to know more about Brunei cannons. This contained all the articles known that have been published about cannons in Brunei and new articles. I was surprised when I saw this postcard up for bidding. 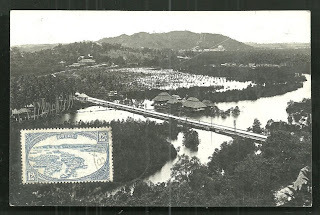 I thought at first it was a Brunei postcard because of the Brunei stamp but when I look closely, the postcard is that of Kota Kinabalu or better known then as Jesselton. In those days, Sabah was administered by the British Borneo Company and Jesselton was named after Sir Charles Jessel, who was then the Vice Chairman of the company. Jesselton did not become the capital until after the second world war. This postcard shows the Karamunsing and Hospital Road way back in 1932.